Caravan internal furnishings and camping equipment, including deck chairs and awnings, have proven a very popular category for storage with many of our clients; Especially when you consider the expense and seasonal use of touring caravans and a lot of outdoor leisure items. 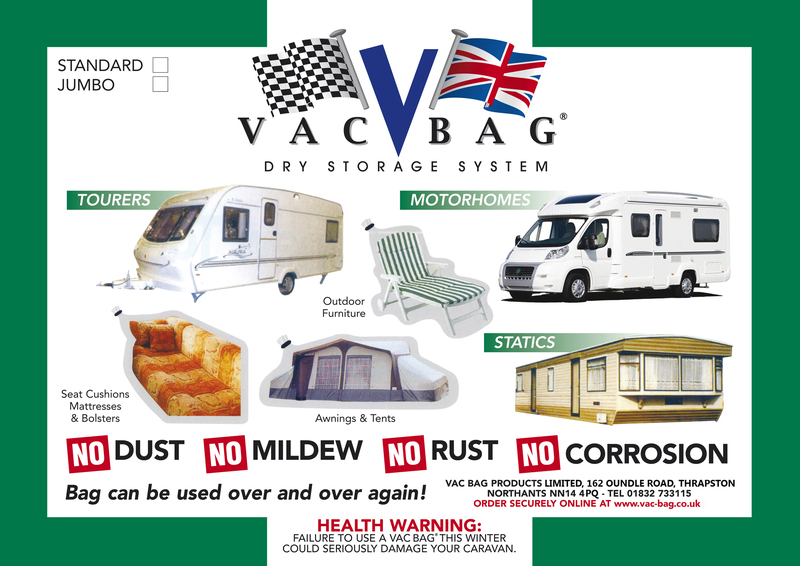 The VAC-BAG® airtight vacuum storage bags provide the ideal seasonal caravan storage solution ensuring mould and mildew prevention. Any type of material used in outdoor furnishings such as chairs, tables, seat cushions and awnings along with any camping equipment such as sleeping bags, tents and camping trailers are all susceptible to mildew, mold and subsequently rot. To ensure mildew & mold prevention, they will need to be stored in an effective airtight environment like the one provided by the vacuum sealing bags used with the Vac Bag® vacuum storage system. Once sealed, they can safely be stored in a damp area without the risk of rot making the VAC-BAG® the ideal garage storage system. Ensure you dry & clean your item before storing in a Vac Bag® dry vacuum storage system to prevent mildew and rot. Storage in a VAC-BAG® will make certain that the next time you go off on your camping holiday or invite your friends over for a barbeque, all of your equipment will be in the same pristine condition as the last time you used them and you will be free from the task of mildew removal.